Captain Hammond’s debut release is the limited edition promo EP Cosmic Candy! with the lead song taken from the forthcoming Hammondbeat album ‘The Origin of Captain Hammond’ (HBR010). 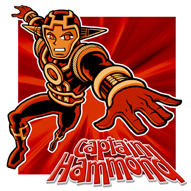 Captain Hammond is the brainchild of Mother Earth’s Bryn Barklam, with Greg Boraman and Pete Collison of Reverend Cleatus & The Soul Saviours on drums and guitar, all promising a mix of Hammond-heavy cosmic rock, gospel, 60s R&B, and Northern Soul. The EP is limited to just 200 and is available to order now, with a release date of November 27th.